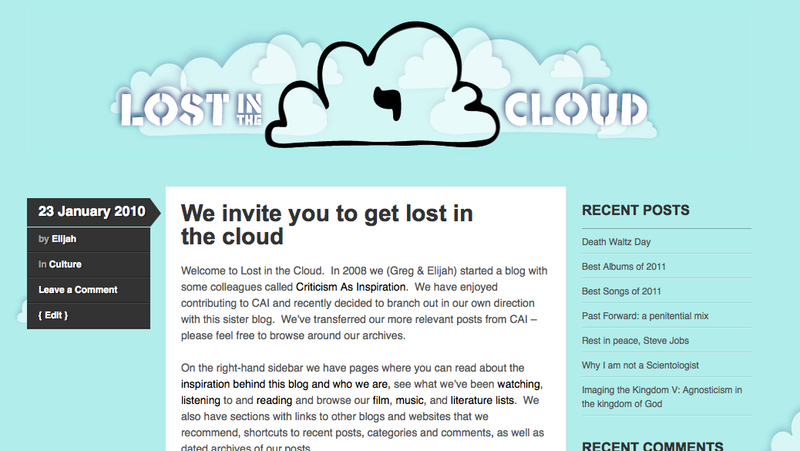 Today, Elijah and Greg celebrate two years of writing on our collaborative blog, Lost in the Cloud. Though we had transferred over some older posts from the previous blog we had created with Greg’s younger brother, Criticism As Inspiration (which still features the header that Greg designed on Microsoft Word! ), our first official post on Lost in the Cloud was published on 23 January, 2010. Since that initial post, we’ve had over 200,000 unique visits to the blog (and to those 200 GRAND readers, may we offer our sincere thanks and warm regards to you). As a way of looking back on these past two years, we thought we would highlight some of our posts that have had the most hits over the past two years, along with drawing attention to a few series that we have produced and other special posts. “Helicopter Megaphone“: A post about the heartbreaking back story of the song “Helicopter” from Deerhunter’s album Halcyon Digest. “Will tomorrow be the ‘end of the world‘”: A helpful explanation of the differences between various Christian views of “the last days” written at the time of the Harold Camping rapture predictions. “Lost in the Sewer: Steve Duncan, Urban Explorer“: A look at urban exploration in the underground of New York City. “Top 20 Bands: 1“: Elijah talks about his favorite musical artist in the climax of his series (see below) on his top 20 bands. Imaging the Kingdom (Parts One, Two, Three, Four, and Five): A series of posts dedicated to exploring the nature of the kingdom of God and its implications in the universe, and therefore in our world and in the lives of all Christians. Top 20 Bands: If you visit the link for Elijah’s number 1 post, you will have links to all 20 of the other bands. “John Stump, composer of Faerie’s Aire and Death Waltz“: This piece about Greg’s uncle has become the singular most viewed post on LITC. While John’s comical music compositions have been viewed around the globe, the post on our site is the one place where people can find out actual information about the composer. “Moby Books: Illustrated Classics Editions“: This post is also a unique resource on the web on a little documented topic, about a series of abridged and illustrated versions of classic books published in the 70’s and 80’s that were Greg’s “gateway drug” into literature. “‘Hipster’ ‘Christianity’: a ‘review’“: Not Greg’s most charitable work, this post takes some below the belt potshots at the book Hipster Christianity. “A Portrait of the Artist in The Age of Adz“: An early review and speculative analysis of Sufjan Steven’s 2010 album, The Age of Adz. The Mirror and the Telescope (Parts One, Two, Three, and Four): An original essay on an evangelical view of Scripture that proposes that there are truly two subjects of special revelation: God and humanity. Reformed and Always Reforming (Parts One, Two, and Three): A summary and analysis of the initial chapters of Roger Olson’s book Reformed and Always Reforming. “John Wenham: An Appreciation“: This was a brief review of the autobiography of a British evangelical biblical scholar who also held to the annihilationist view of hell/divine judgment. As a result of this post, Greg received an email from Wenham’s grandson thanking him for his positive evaluation of his grandfather’s legacy. This post also provided Greg with a number of opportunities to engage with readers on the annihilationist view. “A modest proposal for Sufjan Stevens regarding the completion of his 50 states project“: This was an open letter to the single greatest contemporary American artist (in Greg’s opinion) with an idea of how to continue with the creative endeavor of recording an album for each one of the 50 American states. “A review of Josh T. Pearson live in Glasgow“: This post captured some highlights from an opportunity that Elijah and Greg had to see a one-of-a-kind singer/songwriter in concert whilst Greg was visiting Elijah in Scotland, including a live track from the show. Working on this blog together has been full of delight, insight, and catharsis, and we are deeply grateful for those who subscribe, read, and comment on our posts at LITC. This has been one of the ways that Elijah and Greg have stayed connected over the past few years that Elijah has been working on a PhD at the University of St Andrews and so the blog often captures some of the profound affection, encouragement, and willingness to learn from one another that characterizes our friendship. We look forward to continuing our collaboration into the near future, with the potential of someday even creating a print edition of Lost in the Cloud. Keep your eyes open for forthcoming information and thanks again for joining us these last two years!